The standard version of the Bible in medieval Europe was the Latin version of the Old and New Testament translated by St Jerome (AD 347-420), and known as the Vulgate. It was this version that Johannes Gutenberg first printed in Mainz, Germany, c.1455. Prior to Luther’s own translation, there were some seventeen versions in High and Low German available to readers. One well-known ‘High German’ edition was completed by Anton Koberger, entrepreneurial printer and god-father to artist Albrecht Dürer, in 1483. The plague of locusts is but one of the many remarkable woodcut illustrations in the book. 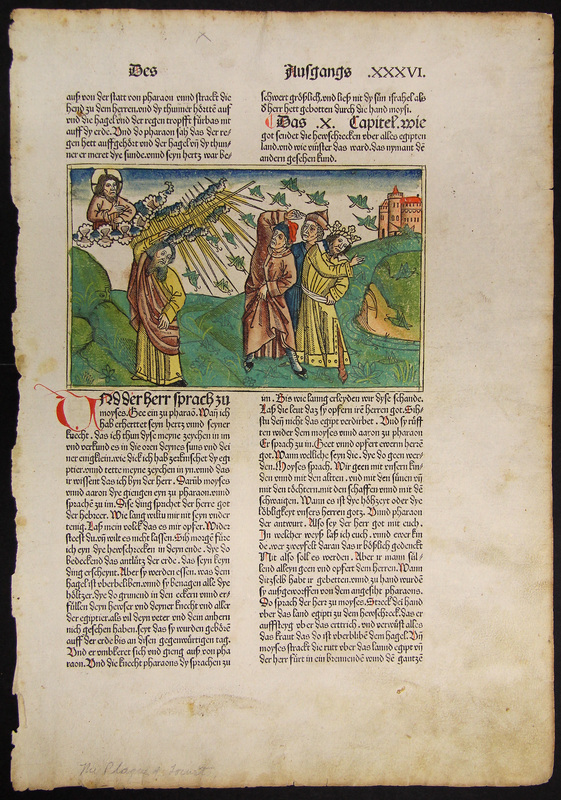 ___, “[German Bible],” ourheritage.ac.nz | OUR Heritage, accessed April 26, 2019, http://ourheritage.ac.nz/items/show/10420.